Established in 2003 by former members of Luton Girls Choir, Pasque Harmony has grown from five to 40 members in just seven years. Performing in churches, village halls, gardens, conference centres and now our first theatre, the choir entertain a variety of fee paying audiences and wedding congregations to raise funds for Keech Hospice Care; details of which can be found on our fundraising page. Pasque Harmony swelled in numbers during 2009 partially thanks to the BBC program 'Last Choir Standing', but still maintain their unique sound and wide repertoire of over 80 pieces. From modern pop songs to classical arrangements, there is no style or period of music that the choir won't take on! The Choir enjoy performing with other choirs and over the last 2 years, these have included the world renowned Morriston Orpheus Male Voice Choir and The London Welsh, Peterborough, Stevenage and Vauxhall MVCs. 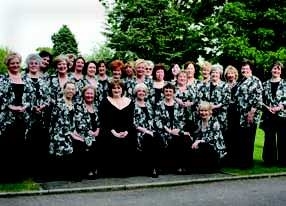 Combined with concerts regularly compered by well known personalities such as Pam Rhodes and Esther Rantzen, the choir's reputation and standing amongst the other performers has grown enormously. The Choir's silent members who work hard behind the scenes are equally dedicated, supporting each event by selling tickets, providing refreshments and countless other tasks before, during and after the performances. Their tireless generosity is invaluable to the choir and they are equally responsible for Pasque Harmony's success. New for 2009 was the production of their first CD featuring an array of songs selected by their loyal audience members. Pasque Harmony is delighted that Carol Jarvis has agreed to become a Patron alongside Lord & Lady McKenzie. Carol is a professor of trombone at Trinity College of Music in London and Vice President of the British Trombone Society. As well as performing and teaching, Carol writes orchestral arrangements for artists such as Seal and most recently has been arranging the horn section parts for his laest album 'Commitment'. Her session work features on a number of commercial soundtracks for feature films, advertisements, jingles, albums and singles and we are very fortunate to have secured her support. Pasque Harmony has released a new Christmas CD featuring many of your favourite Christmas songs. See Newlsetter Christmas 2011 for Details.